NEW DELHI: Defence Minister Pranab Mukherjee on Tuesday termed the 8.9 per cent increase in the outlay for defence as "modest." The Defence Ministry would seek more funds as previous contractual commitments had left it with just Rs. 1,000 crore for acquisition of weapon systems. Mr. Mukherjee said he had discussed the issue with Finance Minister P. Chidambaram and a higher outlay could be sought in the Supplementary Demands for Grants late this year. Mr. Mukherjee said a redeeming feature was the reduction in the proportion of revenue account in the total defence outlay by 1.5 per cent, though the revenue expenditure had gone by about Rs. 3,000 crore to Rs. 51,542 crore. This took place because of a higher hike in capital outlay (Rs. 4,400 crore) to Rs. 37,458 crore over the revised estimates for 2005-06. Of the capital outlay, an overwhelming amount - Rs. 29,990 crore - was for big-ticket purchases contracted in the past. In terms of shares for each wing, the Army received an overwhelming share of 47.5 per cent (47.26 per cent during the current year), the Air Force 28 per cent (30 per cent this year), the Navy 18.14 per cent (17.84 per cent) and the Defence Research and Development Organisation (DRDO) 6.13 per cent or Rs. 5,454 crore (4.9 per cent). A closer examination of sub-sectoral allocation shows that the accounting head of the Defence Ministry receives Rs. 357 crore more, the major beneficiary being the Coast Guard. The Army receives Rs. 1,615 crore more than the current year’s revised estimates under the revenue head. Over one-third of the increased outlay has been claimed under the head of pay and allowances and medical benefits. Over Rs. 500 crore has been given under the head for stores and works. The Rashtriya Rifles, the specialised counter-insurgency force for Jammu and Kashmir, and the National Cadet Corps are the other gainers. The Navy too gets more under the revenue account with the bulk of the hike of Rs. 426 crore claimed under stores, repairs and refits and allocation on joint staff account. The higher revenue account allocation of Rs. 716 crore for the Indian Air Force also sees stepped up outlay for stores and works. In all, the three services received about Rs. 1,500 crore for stores and works. The DRDO has been allocated Rs. 220 crore more, mainly on the stores and works accounts. 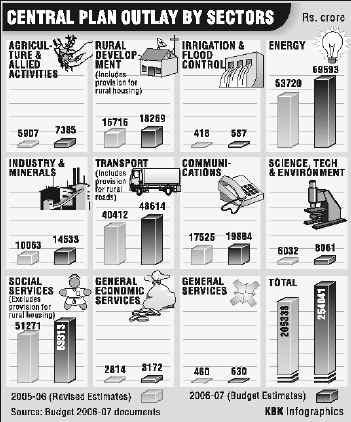 But there is additional inflow of funds from the three services and Mr. Mukherjee has put the total outlay at over Rs. 5,000 crore. On the capital account, the Defence Ministry was unable to spend Rs. 1,300 crore mainly due to shortfalls in the "other equipment" category for the IAF (over Rs. 1,000 crore) and the naval fleet accounting head (over Rs. 600 crore). The inability to spend on these accounts was partially made by higher spending by the Army and the IAF (both under the aircraft and aero-engines heads) and the Army and the Navy under the "other equipment" column. Of the higher capital outlay of Rs. 4,383 crore in the budget estimates for next fiscal as compared to the revised estimates, the IAF accounts for the bulk of the increase (about Rs. 2,800 crore) under the aircraft and aero-engines and other equipment heads. In this respect, the IAF failed to spend Rs. 1,169 crore under the other equipment outlay for the current fiscal. The naval fleet account also received Rs. 785 crore more, mainly to make up for the unspent Rs. 624 crore under the same head this year. The dockyards and special projects too receive an additional Rs. 200 crore.